Provo • The brother of BYU football star Francis Bernard says the Cougars’ junior linebacker is being forced to redshirt against his will and wants to transfer to rival Utah. 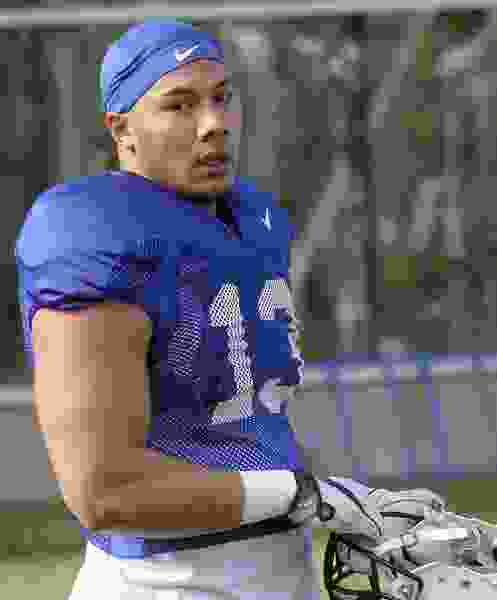 James Bernard, 25, a former walk-on at Utah who completed his college career at Winston-Salem State in North Carolina, said his 22-year-old brother has asked BYU for a release. Francis Bernard did not immediately return calls or text messages seeking comment. A BYU football spokesperson also did not immediately respond to inquiries about the situation. No so fast, James Bernard said Friday. He said the reasons why BYU wants Francis to redshirt this season are “fuzzy” and haven’t been properly communicated to his family. He acknowledged that they are related to the school’s Honor Code. Francis Bernard was suspended from the Poinsettia Bowl last December for violating team rules, but told The Tribune during spring camp that he was in good standing with the school and the team, and eager to play this fall. James Bernard said his brother has an ecclesiastical endorsement from the bishop of his student ward at BYU, required of all students who attend the school owned and operated by The Church of Jesus Christ of Latter-day Saints. He said the bishop, Bernard’s parents and the player himself have had several meetings with representatives from BYU’s Honor Code Office this summer, but the representatives have never told him exactly how he ran afoul of the code of conduct. In January of 2014, BYU ended its practice of publicly acknowledging whether a student had been disciplined by the honor code office unless that student had announced a transgression publicly or if it was a matter of public record, such as an arrest. James Bernard said the family is bitter because there was no indication from BYU that Francis’ playing status was in jeopardy until the first scrimmage of camp on Aug. 5. James Bernard said as of Friday evening his brother had not been contacted by any coaches from Utah. BYU’s response to Bernard’s transfer plans are unclear. One option the school could take could be to refuse to release him to another in-state program, but let him go anywhere he wants out of state with its blessing. Student-athletes who transfer from one Division I program to another must sit out a year, per NCAA rules. Athletes who get “released” from the school in which they depart can begin receiving financial aid and support and can be contacted by schools to which they are released.